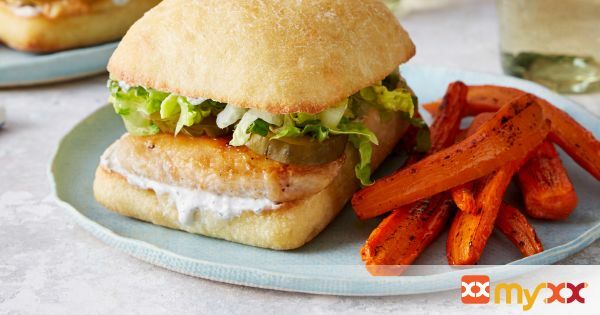 Tonight’s chicken sandwiches get a lift from a lighter take on zesty ranch dressing. We’re combining the traditional buttermilk with Greek yogurt before seasoning it with a savory blend of dried herbs and spices, including parsley, dill, and garlic powder. Tangy pickle chips and thin-sliced lettuce complete the sandwiches with delicious crunch. 1. PREPARE & ROAST THE CARROTS: Preheat the oven to 475ºF. Wash, dry, and peel the carrots. Halve lengthwise, then crosswise. Place on a sheet pan; drizzle with olive oil and season with salt and pepper. Toss to thoroughly coat. Arrange in a single layer. Roast 17 to 19 minutes, or until lightly browned and tender when pierced with a fork. Leaving the oven on, remove the roasted carrots from the oven. Set aside in a warm place. 2. PREPARE REMAINING INGREDIENTS & MAKE DRESSING: While the carrots roast, halve the rolls. Wash and dry the lettuce. Cut off and discard the root end. Thinly slice the leaves. In a bowl, whisk together the buttermilk, yogurt, and spice blend; season with salt and pepper to taste. 3. COOK THE CHICKEN: While the carrots continue to roast, pat the chicken dry with paper towels; season with salt and pepper on both sides. In a large pan (nonstick, if you have one), heat 2 teaspoons of olive oil on medium-high until hot. Add the seasoned chicken and cook 4 to 6 minutes per side, or until browned and cooked through. Turn off the heat. 4. TOAST THE ROLLS: While the chicken cooks, place the rolls on a separate sheet pan, cut side up. Drizzle with olive oil and season with salt and pepper. Toast in the oven 4 to 6 minutes, or until lightly browned. Remove from the oven and transfer to a work surface. 5. ASSEMBLE SANDWICHES & SERVE: Divide the dressing among the cut sides of the toasted rolls. Top the roll bottoms with the cooked chicken, pickle chips, and lettuce. Complete the sandwiches with the roll tops. Divide the sandwiches and roasted carrots among 4 dishes. Enjoy!